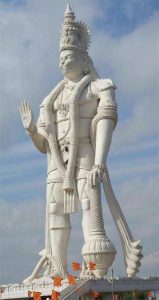 Regard the image on the right here: it shows a 41 meters high Hanuman monument at Yerravaram, Andhra Pradesh, in India. There is a very common tradition in India of displaying idols of Hanuman in super-human dimensions and height. As our Cosmic Advisors have told us, Hanuman is both the vanara (race of monkeys) of the Ramayana and the Star-being who protected this planet. Hanuman was here defending this planet as a Star-being, more than 400 million years ago. We are also told that Hanuman is the protector of this part of the galaxy and the oversighting protector of Planet Earth. On this day of Hanuman Jayanti (celebration of Birthday), we recollect Hanuman, the Universal figure.